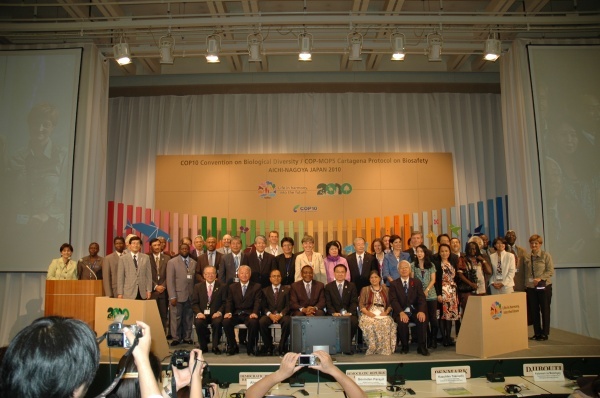 The launching ceremony of the International Partnership for the Satoyama Initiative (IPSI) was held at a side event during the 10th meeting of the Conference of the Parties to the Convention on Biological Diversity (CBD-COP10) on 19 October 2010 in Nagoya, Japan. More than 500 participants, including government delegates to the COP10, NGOs, the media, researchers, private sectors and diplomats, celebrated its launch making the event a great success. The IPSI is an international platform for organisations dealing with the maintenance and rebuilding of human-influenced natural environments (socio-ecological production landscapes), that have been maintained sustainably over a long time, for the benefit of biodiversity and human well-being. This ceremony announced and celebrated the launching of IPSI, and introduced its objectives and activities for the delegates of CBD-COP10 and other stakeholders and partners. At the ceremony, 51 organisations, including national and local governments, research and academic institutions, non-governmental organisations, indigenous and local community organisations, private sector organisations and United Nations and other inter governmental organisations, which applied for the membership prior to the launch were introduced as IPSI partners. The programme of the ceremony, speakers’ presentations, and IPSI member introductions are now available on the website of the Satoyama Initiative. Also, the event webcast is available on the CBD website.